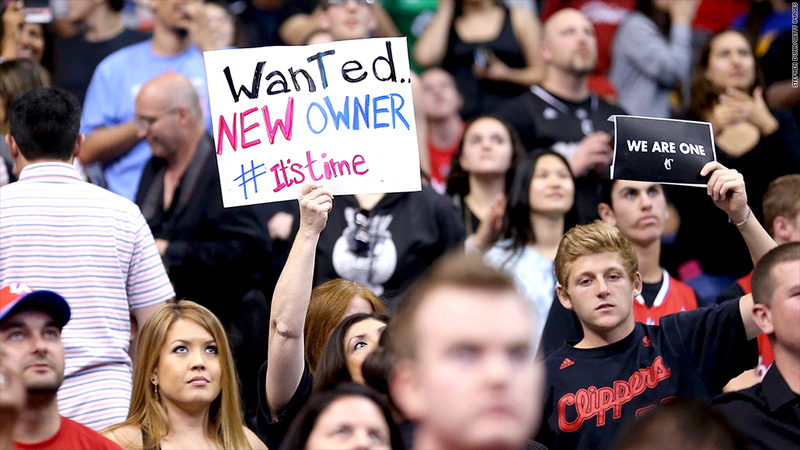 Fans at the Clippers' playoff game Tuesday night. If Donald Sterling does sell the Los Angeles Clippers, he will find many wealthy buyers and likely a huge payday. 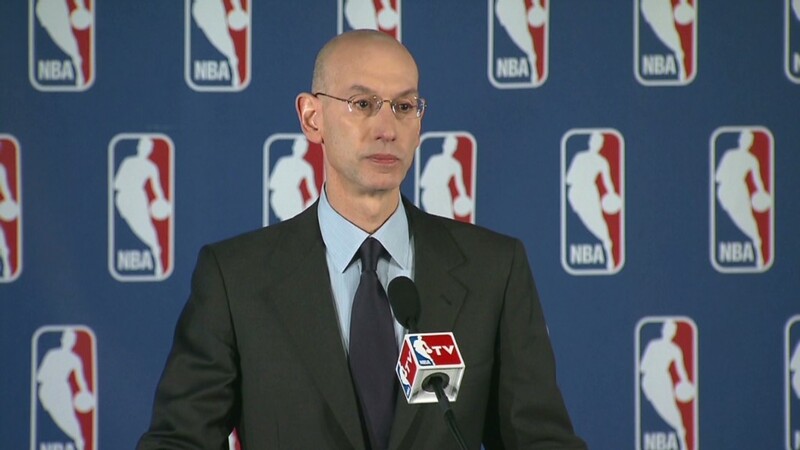 NBA Commissioner Adam Silver announced on Tuesday that he would ask the league's other 29 owners to force Sterling to sell the team after a recording of Sterling making racist comments surfaced. Silver also banned the owner from the league for life. Sterling has not yet commented on his plans for the team, but several other owners have said they will back Silver's request. It didn't take long for some potential high-profile buyers to confirm they are interested in buying the team. Oprah Winfrey's spokeswoman Nicole Nichols said Wednesday that Winfrey is in discussions with media mogul David Geffen and Oracle (ORCL) founder Larry Ellison about a possible joint bid for the team should it become available. Ellison, who Forbes lists as the third richest American with a net worth estimated at $41 billion, had previously been interested in buying the Golden State Warriors when that Oakland-based team was sold for $450 million in 2010. Geffen had previously expressed interest in buying the Clippers in 2010, but Sterling did not sell at that time. Geffen's spokeswoman Priscila Giraldo confirmed to CNN that he is interested once again. Former boxer Oscar De La Hoya also confirmed he want to own the Clippers. "The league has made it known that it wants more minorities involved, and as a proud Mexican-American, I will bring a different perspective to the NBA in general and the Clippers in particular," said De La Hoya. There have been numerous reports that former Lakers star Magic Johnson, who now is managing partner of the Los Angeles Dodgers and who formerly held a 4.5% stake in the Lakers, is interested in the Clippers. Silver, when asked about Johnson as a potential owner at Tuesday's press conference, welcomed the idea. "Magic Johnson knows he's always welcome as an owner in this league. He's been a part owner in the past of the Los Angeles Lakers, and is always welcome and a close friend of the NBA family." According to Forbes, which tracks team valuations, the Clippers are worth $575 million, up from the $12 million Sterling reportedly paid in 1981. That valuation would mean a 12% annual gain. But other experts put the fair-market value of the team much higher. Patrick Rishe, a professor of sports business at Webster University, says that the team is worth at least $750 million and that a bidding war could quickly take the sales price up to $1 billion or more. Rishe points to the recent sales of the Milwaukee Bucks and Sacramento Kings, two of the lowest-revenue NBA teams, which each recently sold for about $550 million. He also said that new NBA television rights deals are expected to command higher fees, which should in turn lift the prices of all franchises. With sports programming less prone to time-shifting and commercial skipping by viewers, advertisers and broadcasters are eager to get that programming, Rishe said. He added that the most recent collective bargaining deal also benefits the NBA owners and franchise values. "You almost have to be a crash test dummy not to make money in the NBA given that the cost structure and economics," he said. The Clippers have traditionally been the second team in Los Angeles behind the richer and more popular Lakers. But the team has become far more popular in recent years. It has sold out every game since February 2011 and has two of the NBA's most marketable stars -- point guard Chris Paul and forward Blake Griffin.